Brian Greene talks to Larry Withers about his new documentary on one of the greats of noir fiction for Al Guthrie's Noir Zine. The documentary was made by Larry Withers, who happens to be Elaine’s son. When his mother died in 1986 Withers discovered among her effects papers relating to a marriage, and subsequent divorce, that no one in the family knew about. He came to realize that his mother’s partner in this clandestine marriage was a writer named David Goodis. Withers got intrigued and started learning about Goodis, and his thorough research into the author’s life story and writing record serves as the basis of the documentary. "Love between the ugly/is the most beautiful love of all." I haven't kept up with all the Goodis mania of the past five years or so so forgive me if what I'm about to say has been said not only better but quite often as well. To me Down There is one of Goodis' finest novels filled with all his strengths and none of his weaknesses. The world here is his natural milieu, the world of America's underclass. Yes, there are working class men and women in Harriet's Hut, the tavern in which a good share of the action happens, but most of the book centers on two people, Eddie Lynn, the strange protagonist and piano player and Lena, the strange somewhat masochistic waitress. They live on pennies. This brilliant film is an example of existential angst wrapped up in a modern Noir type of packaging. It was not truly appreciated when released in the theaters but is well worth watching and owning. The film is so engrossing that the reading of the dialogue is not wearisome as some foreign films are. The directors stylistic use of images to hint at and suggest deeper themes is truly artistic. Not only that, the book it is based on is an often overlooked novel by one of America’s less appreciated authors David Goodis. He has often been the author of books chosen for the films. His 1st novel DARK PASSAGE was, of course, a challanging vehicle for Bogart. You will not regret purchasing the film. But PLEASE read the book too. You will never regret the experience of seeing the lonely of the loser struggling against all odds just to survive as a descent man in a world set against him. Good acting by Gerard and Natasha as well. Money well invested. Kicking off the "Streets of No Return" series with a screening of Delmer Daves's Dark Passage (1947), PFA curator Steve Seid outlined in his introductory remarks that hopefully—along with the series' objective of spotlighting the work of a lesser-known pulp writer like David Goodis—would be an attempt to gain a sense (over the length of the series) of the concept of filmic adaptation of literary works; to finesse what's left behind when novels are adapted, or what is included to make them screenworthy; and to determine if justice has been done to the writings of David Goodis. Succinctly profiling that Goodis began writing in the late '30s, with a brief irreconcilable stint in Hollywood in the late '40s, Goodis parted ways with Hollywood to return to "a decrepit life" in his hometown Philadelphia until his death in the '60s. Even while he was alive, however, non-Hollywood film directors began adapting his books and Seid boasted that all but three of those adaptations would be included in the series. Detailing the "fate" of the omitted three in passing mention, Seid admitted that Rue Barbare (1984)—aka Barbarous Street or Street of the Damned, adapted from the Goodis novel Street of the Lost (1952)—was admittedly not included because Seid didn't particularly like the film and it was too much bother to secure. But he had wanted to get the two other films: Sam Fuller's last project Street of No Return(1989) and Pierre Chenal's Section des disparus (1956). As Seid mentioned earlier in his preview for The Evening Class, Street of No Return was in the hands of some "questionable" people in France and research into the making of that film revealed Fuller's troublesome interaction with the film's "producers/crooks." As for the third film, Section des disparus based on the Goodis novel Of Missing Persons (1950), it's nearly impossible to locate due to its rarity. Filmed in Argentina by Pierre Chenal in 1954-1955,Section des disparus survives possibly only in 16mm prints, none of which Seid was able to track down. He has seen the film and found it to be a "quite nice" economical noir, representing a historical trend in the mid-50s when French filmmakers filmed cheaply in Argentina. What is included in the series are nine feature films beginning with Dark Passage and continuing through to Moon in the Gutter (1983), which in some ways Seid opined is the "kindest and smarmiest" adaptation of any of the Goodis novels. "But smarmy in just the right way" he qualified, explaining that after a good read of a Goodis novel, "you feel a little dirty." Some of the films—notably Moon in the Gutter—successfully capture that feeling. At the same time that Goodis's novels were being adapted into film, his short stories were being worked up for television on such programs as Sure As Fate (1950), the Lux Video Theatre (1956), Bourbon Street Beat (1960) andThe Alfred Hitchcock Hour (1963). In the 1990s, two cable networks launched mystery series and, coincidentally, adapted the same Goodis short story "The Professional Man", which PFA will screen together with one of the writer-directors, Nicholas Kazan, in person to introduce the pair, affording a glimpse into how Goodis held up on television. Seid then introduced novelist Barry Gifford. "There's a lot you can say about Barry Gifford," he stated, "you can talk about the many many novels he's written, including the great Sailor and Lula series. 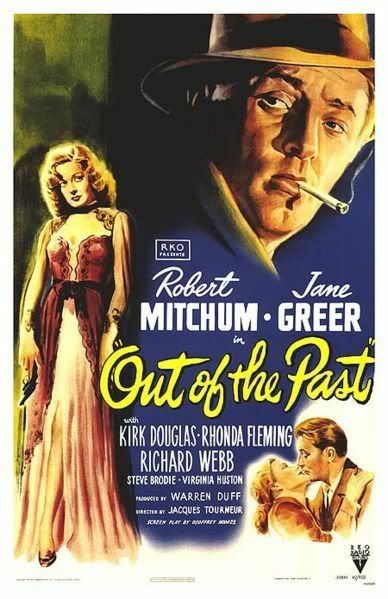 We could talk about the books of film noir criticism [such as Out of the Past]. We could talk about his screenplays, Wild at Heart (1990) and Perdita Durango(1997). But really what places him here in a really important fashion is that he created Black Lizard in the early '80s where he revived noirish and pulpish writers—the most famous one being Jim Thompson—but also Charles Willeford, Peter Rabe, and the great Harry Whittington. 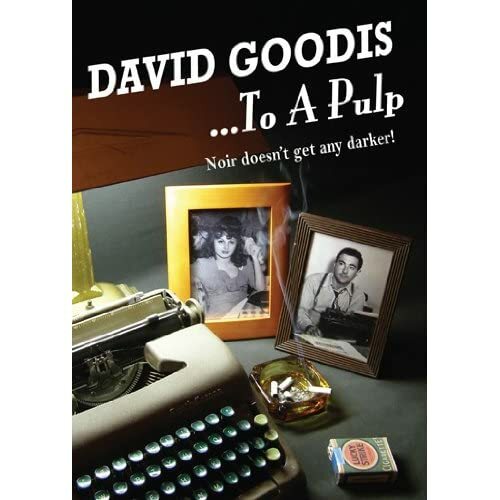 Black Lizard not only launched a new interest in Jim Thompson but really brought David Goodis back. David Goodis had been forgotten. In many ways, because David Goodis wrote so much paperback stuff, it doesn't even exist in the libraries for the most part. They would either buy them and then toss them or simply not buy them because a lot of the libraries had a prejudice about paperbacks. So, there's no one who could launch the series with more right and esteem than Barry Gifford." Gifford then took the microphone and expressed his thanks to Susan Oxtoby and Steve Seid to be invited back to PFA since it had been a while. Listening to Steve's introduction, he realized that one thing that Jack Kerouac and David Goodis had in common was that they were both victims of "momism"; they both lived with their mothers. They were always going back to their mothers, had strong attachments, and never had successful relationships with other women. "Even their relationships with their mothers weren't successful." Though it's been some time since he's reviewed Goodis's work, Gifford recalled the frequent presence of an overriding mother or a wife who's like a mother figure, always making life miserable for Goodis's male protagonists. "He wants to kill her, but he can't really kill her, so he kills other people or he kills himself." Gifford modestly apologized for not really being a Goodis expert. He remembered trying to get David Lynch to read some of the Goodis novels by giving him a couple from the Black Lizard series when they were writing Lost Highwaytogether and when he followed up and asked how Lynch had liked them, Lynch responded, "Those were terriblebooks." Gifford said, "You mean you think they were badly written?" "No," Lynch answered, "they're frightening." His introduction to Goodis came when he first saw François Truffaut's Tirez sur le pianiste (Shoot the Piano Player, 1960), which was loosely based on Goodis's 1956 novel Down There. When he reprinted the novel at Black Lizard, he decided to use Truffaut's title, "purely for commercial reasons." He hoped that maybe someone would recognize the film title and perhaps buy the book. Little did he know that the Black Lizard series would be so successful and—though he always intended to restore the novel's original title when the Black Lizard edition was reprinted—it never worked out that way. In fact, the true Goodis expert, Gifford advised, is a French journalist Philippe Garnier, who writes for Libération in Paris, and who has written the only biography on Goodis that Gifford is aware of: Goodis, La Vie en Noir et Blanc (Paris: Editions du Seuil, 1984). Garnier visited Gifford in the mid-'80s just when he launched Black Lizard to conduct a couple of interviews for Libération, and they subsequently became friends. Garnier was on his way to visit Aldo Ray who was living nearby in Crockett, California. Ray had starred in Jacques Tourneur's Nightfall (1957), adapted from David Goodis's 1947 novel. Gifford also credits the expertise of Geoff O'Brien who wrote the introduction that appeared in all of the Black Lizard editions of the David Goodis novels. O'Brien is now the head of the Library of America. Cribbing from that introduction, Gifford quoted: "[Goodis's 1946 novel] Dark Passage made a considerable splash. It remains one of his best-known books; the only one, in fact, that really made it into the mainstream. Today its appeal derives less from its none-too-believable plot—it was one of the early new-face-through-plastic-surgery stories—than from the author's obvious identification with the persecuted hero and from the jazz-like pulse of the prose. Hero and heroine are drawn together in part by their taste for Count Basie. With the sale of serial rights to the Saturday Evening Post, and the movie rights to Warner Brothers, Goodis had arrived. Dark Passage became a Bogart/Bacall vehicle and Goodis went on the Warners payroll as a staff writer. He was not yet 30 and his career had already peaked." The one novel of Goodis's that Gifford would recommend wholeheartedly is Nightfall (1947); his favorite. Again from O'Brien: "During the Hollywood years, Goodis lived in the L.A. home of a lawyer friend … renting not a room but a tiny uncomfortable sofa for $4 a week. At a time when, as a movie writer, he could have lived well, Goodis apparently refused to spend money on anything. Not out of miserliness but from a sheer perversity, which also led him to drive the same dented Chrysler convertible virtually his whole adult life; a car so miserable that his friends refused to be seen in it. His clothing, as his [lawyer friend] recounts was equally grotesque: 'He wore my old suits and—when they were worn out—he had them dyed blue. Apparently, his whole wardrobe was blue. One day he invited me to eat at the Warner commissary, Dan Duryea was there, and Dave was wearing one of my white suits, which was all yellowed and stained. Duryea asked him where he had dug up the suit and David replied coldly that he had bought it at Gordon's, one of the best tailors in Philadelphia. When Duryea remarked that the suit wasn't even ironed, David gave him a pitying glance and explained that that was how it was meant to be worn. He also had an old bathrobe of mine. He went out at night in it. When he wore it, he pretended to be a white Russian, an exiled prince of the blood.' Goodis would borrow labels from his friend's finest clothes and laboriously sew them into his own wretched hand-me-downs, all for the peculiar pleasure of stopping people short when they criticized his clothing." Gifford admitted pleasure in re-reading Geoffrey O'Brien's introduction because it clearly essayed that Goodis was nuts. There's no question that he was absolutely crazy. Continuing to crib from O'Brien's intro: "A central law of Goodis's fiction is that happiness is forbidden, all true love remains unconsummated, all petty criminals—a breed with whom the author identifies—are caught ignominiously, all proud old men are humiliated, all virgins are molested." In contrast to Steve Seid's enthusiasm for Moon in the Gutter, Gifford countered the movie was so terrible that true cinephiles like Seid find it wonderful. Gifford worked with the film's lead actor Gérard Depardieu on City of Ghosts, which Matt Dillon directed, and asked him at the time about Moon in the Gutter. Depardieu had just undergone a quintuple bypass surgery, arrived in Cambodia to film City of Ghosts and—when Gifford asked him about Moon in the Gutter—Depardieu clutched his heart and said, "Please! Don't ask me about that; I'll have another heart attack!" Gifford refrained from saying anything further on the film because he didn't want to disabuse Seid of his opinions and didn't want to cost him his job at PFA. Gifford finished up his intro with one final quote from O'Brien: "That such testaments of deprivation and anxiety could sustain the career of a paperback novelist is today cause for wonderment. Nothing so downbeat, so wedded to reiterations of personal and social failure could be likely to find a mass market publisher at present. The absolutely personal voice of David Goodis seems almost to have escaped by accident. It emanated from the heart of an efficient entertainment industry, startlingly, like the wailing of an outcast." 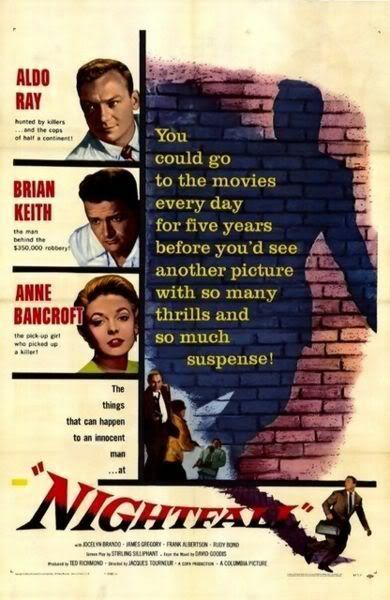 Eddie Muller noted that The Burglar (1955) was something of a homegrown production, in that David Goodis and Paul Wendkos, the film's director, were both from Philadelphia. The producer Louis Kellman wanted to shoot a film in Philadelphia in the late '50s and turned to Goodis who—at this point in his career—had fallen from grace in Hollywood. This reinvigorated Goodis who was excited about working on a film outside of Hollywood and making it with people he knew; in this case Dan Duryea and Martha Vickers, who came to Philadelphia and Atlantic City to shoot this big deal low budget film. 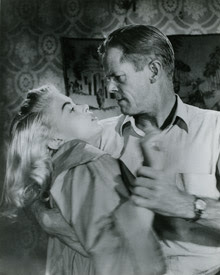 Though IMdb lists the release date ofThe Burglar as 1957, the film was actually shot in 1955 but didn't achieve a distribution deal for two years, which is important primarily because The Burglar features Jayne Mansfield before she was "Jayne Mansfield." Hailing from Bryn Mawr, Pennyslvania, Kellman "discovered" Mansfield while she was shooting Pete Kelly's Blues (1955) where he observed that every guy on the crew was going nuts over this woman. 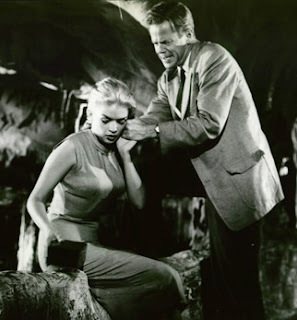 When The Burglar was finally released, it coincided with the explosion of Jayne Mansfield with The Girl Can't Help It (1956) and Will Success Spoil Rock Hunter? (1957). "Believe me," Muller quipped, "[The Burglar] was not sold as a David Goodis production; it was sold as a Jayne Mansfield film." She was full-figure on every poster. Dan Duryea gives a terrific performance in The Burglar, playing a bit against type, less of a weasel and obvious villain as in most of his film noir performances and much more in David Goodis terrain. Though Paul Wendkos went on to have a fairly successful career—primarily as a television director among several feature films—The Burglar was his first directorial effort and exhibits telltale signs of a young director obsessed with the movies, missing no trick in the book that he can trot out. You get it all. You get the camera in the wall safe and every conceivable match cut. All things considered, The Burglar is an exciting piece of filmmaking. Appreciating Steve Seid's earlier comments about his directorship of the Noir City film festival and his active efforts to locate and restore film noir prints, Muller admitted that sometimes the noir universe can make your head want to explode. But every now and then he receives a letter that makes it all worth while and—to that effect—Muller read a piece of correspondence he received from a fan in Iran who had stumbled onto the Film Noir Foundation website. Muller had already admitted to this guy that he didn't "get" how someone in Iran would be interested in American film noir. The fellow responded in somewhat broken English: "Dear Mr. Muller: When I received your mail, it exhilarated me to some extent that it almost woke me up all through the night, all sorts of ideas and thoughts without clear focus came into my mind. One thing is very sure: you made me very happy and thank you for that. It was like a signal from beyond space. In the morning before writing these lines, I was reading morning papers. The possibility of war increases every moment. The lunatic people who are running this country are pushing the nation to another disastrous situation and it seems like nobody cares anymore. Iran has two different and opposed cultural and social layers. One: brute, ugly, uneducated, dangerous, fanatic and corrupt. And the other: intellectual, deeply cultural, decent and advanced in every aspect of life. But the first layer—at least in the world's view of Iran—covers the intellectual side. Every day it casts a darker shadow on the lives of decent people. It's completely a noir plot on a very huge scale, almost apocalyptic. It seems nobody cares if the U.S.—or more possibly Israel—attacks the country because most of the people think this isn't their country anymore. They think they would parade on the streets and welcome American soldiers like what the French people did in 1944. Yes, this is an occupied country. The only difference is it is occupied from the inside. The country under the Islamic Republic rule since 1979 is what I call a perfect noir world: complex paradoxes, nightmarish life, hidden sexual relations, all kinds of bootlegging and illegal activities, political corruption, underground lives—from different variations of criminal life to underground artistic life—reminds us all of the Nazis, and all based upon fate and destiny. Nobody knows about tomorrow. Nobody cares about tomorrow. An existential choice in building a moral world is each individual's cause and brings serious attention to all kinds of arts. Regarding cinema or music in this country, it's equal to finding a murderer in a noir world. It's an inward journey from the surface. Finding meanings from this battlefield of life—as Samuel Fuller calls it—made me stick to cinema almost maniacally. If one more time the flames of war break out in this country, God knows what will happen. The other day I was talking to a friend about how many years I have spent on American arts—movies, jazz and architecture—and if anything happens here and a military confrontation is unavoidable, I will suddenly turn in a second into the enemy. First of all, an enemy of the Americans. Then, if I show any sympathy to Americans, I'll be the Islamic Republic's enemy. This is a noir plot. Now I deeply understand what German immigrants felt in the U.S. during the war and when they came back to their country after the war and what really was the mental foundation of all those great noir masterpieces by Lang, Ulmer, Siodmak, and Wilder. Sometimes when things look so bad and we smell another stupid war near us, I think about Roberto Rossellini's Paisan (1946) when American troops land in the south of Italy and as they're moving north nothing remains but crying babies, dead bodies and dying dogs on the bare ground. Anyway, this daily paranoia is my answer to 'Why film noir in Iran?' "
Director Jean-Jacques Beineix had an international smash with his first feature film, the stylish thriller Diva (1981). His big budget sophomore effort, The Moon in the Gutter (1983), got him booed at all the major film festivals. It flopped in the US, and has been unavailable for years. Cinema Libre has finally given this cinematic folly the DVD treatment as part of the Jean-Jacques Beineix Collection. Is it as bad as its reputation? It's not very good. The Moon in the Gutter is based on the book by David Goodis (1917-1967), one of the less heralded of the hard-boiled crime novelists. Goodis's books, with their taut prose and doomed characters, had previously been well-served by the cinema. Dark Passage, with Bogie and Bacall, and Shoot the Piano Player, Francois Truffaut's adaptation of Goodis's terribly bleak Down There, are well-regarded models of noir and neo-noir, respectively. Hollywood melodrama and New Wave austerity are both reasonable approaches to Goodis's lean, bloody text. Beineix's take doesn't necessarily seem wrong — he makes a gorgeous-looking film, stylish and bloody. And it makes sense on paper to cast Nastassja Kinski as Loretta, the femme fatale, and Gerard Depardieu as Gerard, the schlubby stevedore who falls for her Clairol blonde wiles. Alas, the film is overblown, its saturated colors and over-the-top performances contributing to an atmosphere more kitsch than noir. It's surreal and too literal at the same time: the titular moon is of course reflected in the titular gutter ... in BLOOD! Character and motivation is over-telegraphed by orchestral fanfare and stylish lighting - Kinski's entrance plays like a parody of the film noir dame, the soundtrack welling as she moves in slow motion. 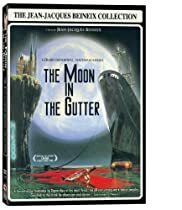 The script is more or less true to the letter of the book (not one of Goodis's best), but for all the money and effort put into the mise-en-scene, Beineix fails to make a compelling fantasy world — and fails even worse at realism, as scenes of dockworkers on the job are particularly unconvincing. Admirers of the actors, the director, the author may well be curious about The Moon in the Gutter,but the cat will not be rewarded with cream. Thatches and blankets. Out of the Past and Nightfall. Eddie Muller specifically asked last Thursday's audience to not compare Nightfall to Jacques Tourneur's earlier proto-noir, Out of the Past, so I'm going to do just the opposite. In his introduction, Muller said that it's a fruitless comparison, that it would only do harm to the later film, but I think they make a fine pair precisely because they are so divergent (yet remarkably consistent). Made a decade apart (1947, 1957), both fear the city and its traps, both distrust people, both seek escape from the world. However, the paranoia of the former is eased, slightly, in the latter into circumstantial nuisance: Jane Greer precipitates an economy of lust, her come hither enigma lighting desire like a good femme fatale, whereas Anne Bancroft rather represents a haven, her curves safe and her eyes welcoming. 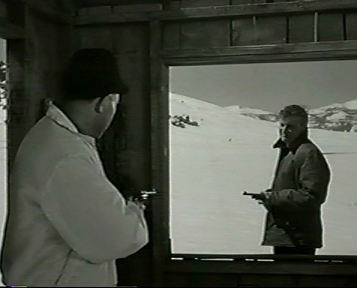 Nobody owns the upper hand in Nightfall, really, over Aldo Ray's Art Rayburn/Jim Vanning -- he's fighting time, and the seasons, as much as the villain bank robbers -- while Robert Mitchum's Jeff Bailey/Markham, from his first encounter with Joe Stephanos (that sly, fey and lovely analog to Greer, Paul Valentine), finds himself trapped by history (his story), by people, by plots, by desire. 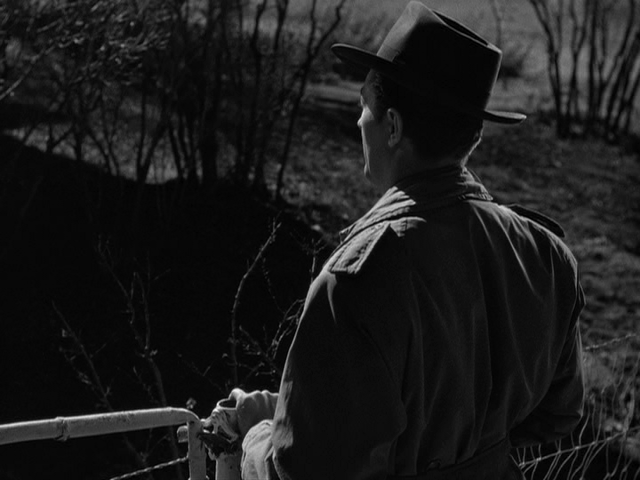 Tourneur didn't seem capable of making a dull image, even in the almost-bland patches of Nightfall's location exteriors. Part of this may be due, simply, to the print and its upkeep, although the picture has a less striking, more television-grade contrast/construction than its predecessor with fewer set-ups and less glamor. 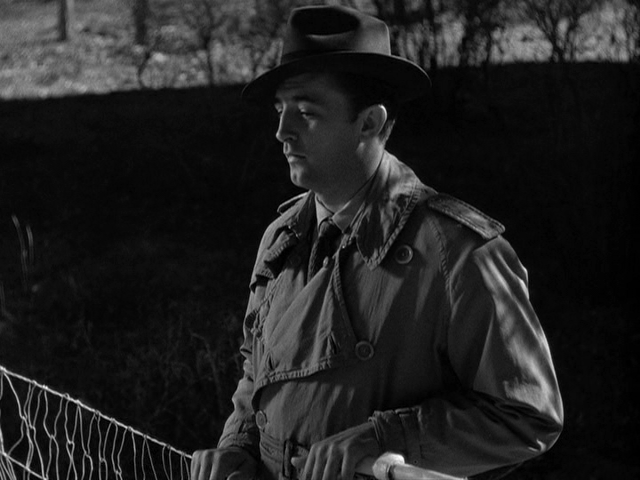 Yet an early dolly retreat, to make way for a bus that fills the screen, is a signature, subtle Tourneur move; and in the day for night interrogation sequence at a derrick field, the flat light does not take away from the compositions. Everything lays at an angle. Even direct, 90-degree frames sit uncomfortable with objects thrust in on a slant, fudging perspective. Tourneur's world is acentered and fluid, despite its classical trappings, the termite auteur par excellence, littered with odd interstitials to syncopate the mise-en-scene. While more pronounced in the earlier film, the more modest later work still rests uneasy, growing out of the performers as much as the technique. Aldo Ray's hemmed posture and choked voice work at odds with his broad Navy body. Anne Bancroft can't quite get comfy and fades into the picture, another prop, almost; something else Ray has to carry. As the go-nowhere villians, Brian Keith and Rudy Bond play off each other so well that it's easy to forget all the other calm-crazy instantiations of other heist duos; Keith, especially, uses that laconic distance to genteel effect, rounding a square character as much as possible. What I find most curious through the first two weeks of the David Goodis series, situated firmly in the middle of cinema's century, is how often things end well. The series opened with Dark Passage, Goodis' splash project. 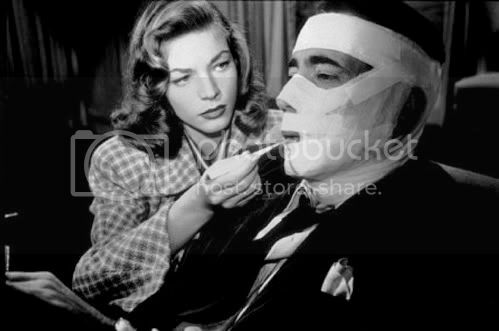 A Bogie-Bacall film directed by Delmer Daves, Dark Passage opens brilliantly, almost exclusively in first person point of view shots, keeping Bogie off screen until he has reconstructive plastic surgery to hide his identity (a San Quentin break-out) until he can prove his innocence, or simply flee for good, as he winds up doing. It's a pretty goofy film, to be honest, but its leads' charisma and chemistry buoy the plot and help sell every melodramatic turn, including its aw-shucks ending, as some kind of idea of what it takes to make your future, to make your dreams real, even if it means forsaking your past. I had to skip the second picture, The Unfaithful (unfortunate since it sounds compelling), and I'd seen Shoot the Piano Player before (a fine, smart picture), so I next caught up with the series with Nightfall. It seems to really do Steve Seid's program justice one should go ahead and read a Goodis or two, but my final weeks of school prevent too much outside reading (I'm slow and swamped), so I feel I'm only getting half the picture. Adaptation is an interesting, demanding process that seems shaped as much by studio demands as authorial concerns, at least in this early phase. Nightfall is a meager thing, and as Seid's pre-screening read from the novel suggests, plenty was left unfilmed -- in particular because of its black and white film stock -- sticking to the plot and little else; however delightful those brief asides with the Frasers are (James Gregory and Jocelyn Brando are the most theatrical actors in the piece, clearly relishing their screen time), the passages operate as exposition, not color. And that's the biggest difference between this later film and Out of the Past: things breathe more in the darkness of the earlier work, each set (and each set-piece) another layer of story, mood, complication. By contrast, Nightfall looks more open, more blank, and allows for more projection; for a film named after night, there's a lot of day, a lot of white. And yet, it's another source of indetermination. The threat in Nightfall is precisely the chance that those empty spaces will be filled by guns and violence, that the wide white blanket at the close has buried things is untenable. Aldo Ray says he wants to keep the money company at the film's close but we don't get to see him and Bancroft and Gregory surround the satchel. It sits solitary, the lone dark spot in a bright field. The music plays triumphant, conclusive, but the image is stark and forlorn. Ray's Vanning/Rayburn may be exonerated and free to start life over with his new bride but it feels undercut. Or, the picture may simply be saying it's a first step; night will fall again and cover this once more. As we may remember from the beginning, the night brings artificial lights that isolate. Indeed: what will Vanning/Rayburn return to? Will he adopt this new name for good, as he tells Gregory's Fraser? Who is he now? The one and only David Goodis makes bleak look so good. This time out, I’m covering three of his novels, all of which are super-depressing noir. It’s not like the guy ever wrote a happy ending, so what could make this holiday season brighter than the man from Philly who reveled in the darkest corners? At least it’s not as depressing as this guy. NIGHTFALL by David Goodis — Claustrophobic and paranoia are two terms that come to mind after reading this 1947 slice of the sunny side of life. Jim Vanning is a wanted man by detectives who claim he killed a guy in a bank robbery, where some of his compatriots absconded with $300,000. But Vanning has no clue if he was really involved or where the money is. We find Vanning at the start of the story as a commercial artist working in New York City. Goodis puts him through a nightmarish run of events, all of which we are told through flashbacks. Vanning is still confused by it all, but a local detective has certain things sussed out, to the point he follows Vanning around and can’t believe this man could have possibly been the mastermind of running off with the stolen loot. OF TENDER SIN by David Goodis — Despondent and troubled sums up main character Alvin Darby in this bleak offering from 1952. To say this book is a downer is again an understatement. Alvin is a married man, but his union is not the strongest. He no longer even sleeps with his wife. And to go from that little happy moment to even darker recesses, Alvin overhears his wife on the phone with another man; Alvin’s summation is, of course, that his wife is having an affair. Thus begins Alvin’s night of despair, where his only goal is to find a woman from his past with platinum-blonde hair. He slowly descends into his own sort of madness, paying hookers just so he can stare at them. Then he steals a knife from a pawn shop so he can exact revenge on the man he thinks is sleeping with his wife. All of this builds to the point where Alvin comes face to face with his long-lost love. Well, in his mind, he thinks he still cares for her. The novel comes off like gangbusters from the start, but the second half sort of loses its momentum, with a whimper of an ending. Again, it’s all about the bleakness of not only Alvin’s life, but the streets of Philadelphia, which are just as dark as his soul. For those looking for a good time and some light reading, here is a book that is sure to put a spring into your step. THE MOON IN THE GUTTER by David Goodis — Closing out this trilogy of despair is probably the lowest you can get. From 1956, it mainly takes place at a rundown dive and the docks in Philadelphia. Fans of THE WIRE’s second season will love it. The story is rather straightforward: Dockworker William Kerrigan has been reliving his sister’s final days over and over in his mind. Her brutal raped drove her to suicide. Throughout the book, Kerrigan revisits the sites of where it all happened, thinking that one day, he will catch the guy responsible. Throw in a high-class lush who frequents the dive bar for shits and giggles, and you pretty much have the whole plot. Then throw in the drunk’s sister, whom Kerrigan falls for, and you got yourself a tale of bleakness that knows no end. Even when the story builds up to what would seem the most logical point, Goodis pulls the rug out from everyone and twists the knife even further. This book thrives on the depression it dispenses in its quick read. That’s one thing Goodis knew how to do better than anyone else: Make every word count. I know these three books are not what you would call “fun,” but that’s the point. I’d much rather wallow in his world than some of the overrated crap that is out there.